Interests - **DO NOT SEND FOOD** Likes Marvel, Batman, music, baking, bubbles, creative activities, going to Beavers. Playing Lego, Playmobil, Minions (Despicable Me), Jamie Oliver, Paul Hollywood. Simple games. Please DON'T send food to Rowan, and NO LATEX i.e. balloons, rubber masks etc, as Cameron is severely allergic to latex so, please do not send anything containing it to the whole family. Please DON’T send food to Rowan or any of his siblings, and NO LATEX i.e. balloons, rubber masks etc, as Cameron is severely allergic to latex, so please do not send anything containing it to the whole family. Rowan was born at home unexpected but on time. Apart from being told we were having a girl (and he was a boy) and he was cold due to being born in the bathroom with the windows open, the midwife said to his daddy that all was “normal”. For the first six weeks of Rowan’s life it was a whirlwind of no feeding, force feed, trialling formulas, projectile vomiting and screaming, along with a complete lack of weight gain. This carried on for 18 months. They tried an ng tube, force feeding, an nj tube, surgical jejunostomy, solid foods, ANYTHING to get Rowan to gain weight and nothing worked. Rowan was under GOSH as well as our local hospital and no one knew what to do. At 18 months old and weighing just 9lb12oz, Rowan was admitted to GOSH and we were told to “expect the worst”. The next 8 months GOSH was home, full of ups and downs. Rowan had a Hickman line inserted and started TPN. For the first time ever Rowan began to gain weight consistently and went from strength to strength. As this happened a lot more medical problems began to arise. Rowan had to undergo a huge number of tests to get to the root of his weight problem and these tests are still ongoing. Our biggest battle will always be with his calorie requirement. The average child needs 90 calories per kg. Rowan needs a minimum of 240 calories per kg. He has the same number of calories as a fully grown man. Rowan emerged from GOSH almost twice the child he was when he went in. Rowan has a lot more energy, a huge personality, and is making huge leaps in all areas. As I write, Rowan is awaiting more tests at GOSH and his calorie requirement has increased. Rowan may be the size of an 6 month old, but he has defied the odds, fighting his way through life with a very cheeky grin and a little bit of attitude! Sorry it’s taken so long to update on Rowan, time goes by so quickly sometimes! On the whole Rowan has been quite well. Rowan is now on hydrocortisone as he has added Multiple Pituitary Hormone Deficiency (MPHD) into his list of ‘issues to contend with’ and will be on steroids for the rest of his life, it’s just another risk to manage. We have been back in hospital more recently to check that the level he is on is correct. We have had a couple of other admissions around central line infections, infections around the various ‘holes’ in his body, and we are currently battling with one of those right now. Rowan is colonised with Staph Aureus, however that has now become MRSA. He’s struggling a lot with pain and fatigue, and it’s hard to know if this is deterioration in his management, due to the infection, or if we need an increase in meds, as he’s finally growing like a weed! Behaviourally and emotionally however, we are finding things very difficult. Rowan has seen a psychologist and we are trying to work with him, however it looks like he is emotionally ‘stuck’ at a 3 year old stage. Imagine toddler tantrums in a 9 year old, he has a lot more weapons in his armoury than a 3 year old though unfortunately! This has also meant, that despite not being developmentally delayed in any way, he is torn between playing with younger children’s toys, and age appropriate toys. He seems to currently have a real liking for toys where you press a button and it lights up/makes a noise. He also is very attached to his baby Michael. Thank you to those who have sent Rowan post, I know we don’t post as many pictures as we usually do, things are just particularly difficult at home at the moment, especially with Ayden, possibly struggling with ADHD/ASD, we are waiting for assessments. He has a habit of running off, with no consideration for danger, so it’s particularly difficult. We want to say a massive thank you to Sarah and Fudge the cat, who always sends the BEST monthly projects!! Also to WendyWoo for the fantastic drainage bag covers! Rowan loves having such a wide range of choices now! Also, to Marty Longo, Rowan loves the consistancy of receiving cards from you, from such a long way away! 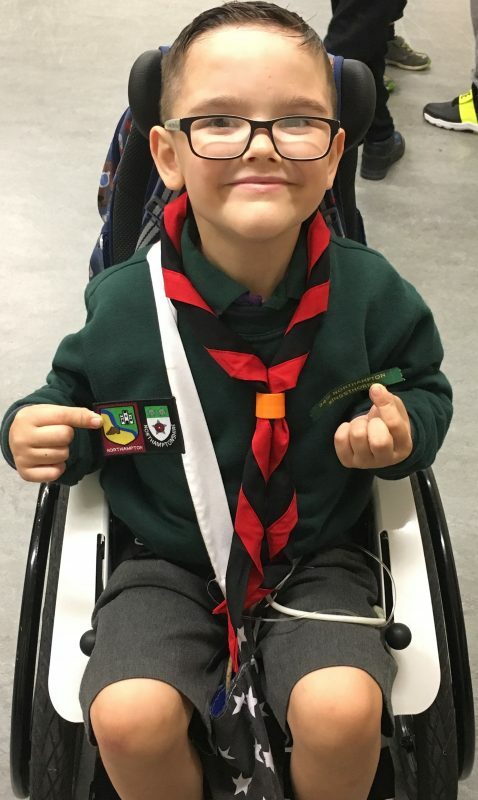 Rowan has also been receiving letters from a little girl who goes to ‘pen pal’ club at school, and he has written back to her, and received another letter! We are hoping to write another letter to her over the weekend. It’s nice to see him excited to write to another child of a similar age! Thank you post pals for everything you do for all the children. Generally Rowan is doing ok! Since the stoma prolapsed in June we have had lots of issues with controlling his sodium levels and his output being really high and of not great consistency. Literally this week his sodium levels are FINALLY where they are meant to be, we had to increase the sodium in his TPN twice to get it to work, giving him sodium supplements through his tube seemed to do nothing. I was more than a bit gutted as I thought we could start weaning down the TPN a bit soon, but I don’t think that’s going to be happening for a little while. Rowan also appears to be colonised with a fungal infection, Candida and no matter what we treat it with, it’s not going away. The risk is that this translocates to his Hickman line, and Candida is one of the worst bugs to treat :(. So he had a specialist swab done to see exactly what we can use to treat the infections, as he has more than one strain of the bug, and go from there hopefully! Over the summer we spent 3 weeks in hospital with a very poorly Rowan, he had a line infection Klebsiella, and it was very scary for everyone. He ended up in the critical care unit in Oxford as we transferred from the hospice. From there we made it to our local hospital only for him to deteriorate again :(. Rowan was really upset, as were his brothers, as it meant our days away had to be cancelled, again. So it wasn’t a particularly great summer, but we made the most of it where we could! Following this particular bug, it was noted by the hospital that Rowan has some really bizarre issues with Tachycardia that have developed. We’re not sure what this is all about at the moment but we’re keeping an eye on it for now! In the meantime Rowan is struggling more emotionally than physically. He’s angry a LOT. He’s struggling with his pain levels as he is not listening to his body, and his fatigue is also an issue as he’s refusing to rest. He’s hating being small. He doesn’t want TPN or feeds, or having to go to the hospital anymore, and he currently doesn’t like school. Everything is a battle at the moment with lots of tears. He’s even playing up in school. We are waiting for play therapy but at the moment we won’t even seem to be on a waiting list anywhere. Everything is so slow, and at the end of the day it’s only going to get worse if we leave it. Thank you to those who send Rowan post, especially Sarah and Fudge, Kim and Stevie and Marty Longo, also thank you to Zara and Raffle pals for the amazing gluten and dairy free chocolate hamper! It went down very well and caters to the boys dietary requirements really well. Can people PLEASE not send food to us. The boys ALL have food allergies, and I have had to confiscate a number of food/sweet items from them. Can we also make sure NO LATEX is sent, this includes balloons (unless they are foil). This month Rowan has been doing well. Lots of appointments over the last 6 weeks or so, endocrine say he is growing ok now he’s on growth hormone and even though he still isn’t on a centile for his height he’s in proportion with his weight and that’s the most important thing. We will see them again in six months as we’re having a few issues with his blood sugars dropping too low when he’s not on his TPN (he’s getting 5 hours break currently!) and him becoming extra tired and grumpy, but for now it’s a case of just watching and waiting. We went to see the gastro team as planned and we really wanted them to reduce the amount of TPN Rowan is on, but it wasn’t to be. They have decided, this close to surgery, we need to just stay as we are, as he is currently stable and we don’t want to rock the boat, plus, it’s possible we will be back to 24 hour TPN temporarily and we know the amount he’s on currently keeps everything ticking over nicely. Rowan is due to have Ileostomy surgery on the 1st March. He’ll be in Great Ormond Street for approximately 2 weeks. This is quite big surgery for Rowan, and the recovery time can be rough, as well as adjusting to a new way of life. However, we are hoping this will improve Rowan’s quality of life long term and the aim is to reduce the TPN, and hopefully one day, get him off TPN altogether. Thank you so much to everyone who sends Rowan and his siblings post!! Especially Sarah and Fudge the Cat! If anyone has sent Rowan little Lego sets, or craft sets, we have saved them for when Rowan goes for surgery as these are perfect for those times when he is bored. During the recovery for the next surgery, I am hoping the post he receives will lift his spirits. Thank you to everyone for everything that is sent!! Since the last update, Rowan was transferred to GOSH by blue light and was incredibly poorly. In the end they took his line out, and replaced it with a new one. Unfortunately due to a lack of central venous access they have had to use Rowan’s femoral vein. This also means he only has ONE vein left in which a Hickman line for TPN can be placed. This is not a good situation to be in. Rowan is currently dependent on a Hickman line to sustain his life. Since September we have tried to carry on life as usual and not worry too much about the ‘what ifs’. We had a week at Helen House in December, which was rather more hard work than it should have been, and some of Rowan’s pain medications were adjusted to help him, however we had a lovely Christmas at home together which we are very grateful for, and thank you so much for the all fantastic elf parcels, reindeer letters, monthly projects and post that came. Rowan has also been trying an extra hour a week at school for enrichment time which he absolutely loves!! This takes our total up to 16 hours a week of school, the most he has ever been there!! Since the beginning of the year we have been waiting on tenterhooks for a date for a large surgery for Rowan. Nothing can really change or move forwards until this surgery has been completed. He is having an Ileostomy placed. This is a step that hasn’t been taken lightly at all. Neither Rowan nor I are adjusting to the news very well. Surgery will now be in March, after a lot of messing about, we still don’t have an exact date. This will be a massive adjustment for Rowan, and he is currently finding the idea more than a little but upsetting. The admission to GOSH is likely to be 2 weeks. As always though, post pals post gives him something else to focus on, and to distract him from it all for a little while! So thank you!! Late last night Rowan was transferred to HDU. He was very poorly for most of yesterday, he drifted in and out of sleep until the middle of the afternoon. He wasn’t eating or drink or talking or even sitting up. He didn’t even have the energy to boss anyone around. Constantly spiking high temperatures despite IV paracetamol, and being on day 5 of antibiotics. Last night we did bloods, and they came back not looking good at all. Although he did manage 90 minutes of crafting in the activity centre and a few rounds of Mario Cart with the pink ladies before becoming overwhelmingly exhausted once again. So, he was transferred to HDU where he had a fluid bolus as his Blood Pressure was too low, and he had his antibiotics changed a little bit. So rather than having ones that are once a day, he has 3 that are once a day, and 1 that is 4 times a day, he is on gentamicin, teicoplanin, micafungin and tazocin, all IV antibiotics. He has complained during the night of a bad headache, which tends to go with a line infection, although we don’t usually have that for more than a day or so. So we are now on day 6 of the line infection saga, and he seems to be deteriorating, not improving. If he doesn’t start to improve in the next 24/48 hours, there is talk of transferring us to GOSH. Fingers crossed these new antibiotics help a lot more, and put him back on track so he can start bossing people around again. 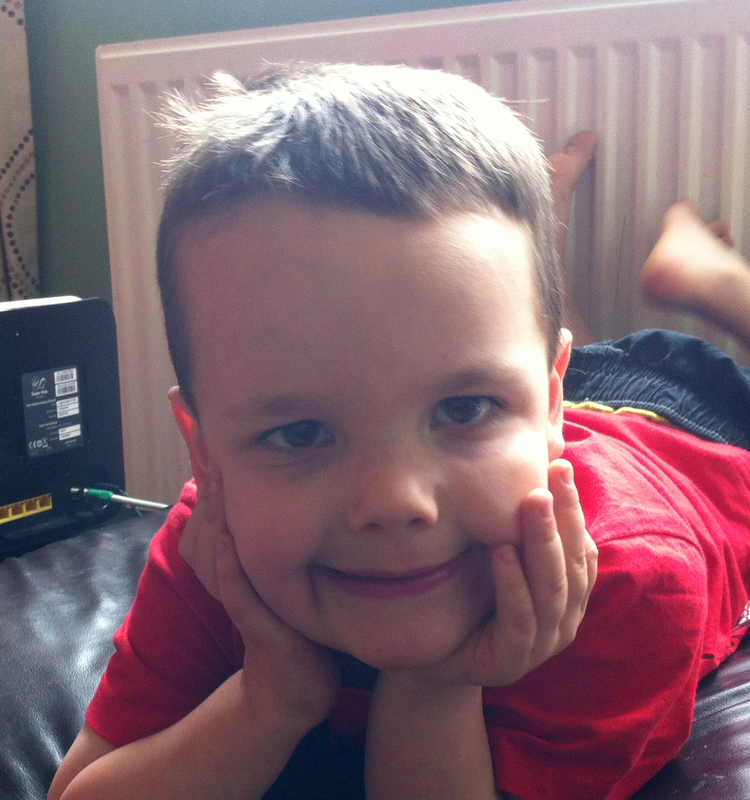 Rowan is currently an inpatient at our local hospital and has now been in hospital for 2 weeks. His central line broke inside his chest causing a great deal of pain. This meant we were in hospital on IV fluids awaiting a line change. This happened last Friday, it didn’t seem to go to plan, with much larger incisions than previously, a new exit site, and lots more bruising and discomfort. Since then he has spiked really high temperatures. After a week of testing and waiting for results we have found he has a really, really bad infection in his various sites and wounds. We thought putting him on the right antibiotics at a high dose would sort him out, and we were hoping to go home ASAP. However, 3 days into these high dose antibiotics and he is still spiking temperatures despite regular paracetamol and ibuprofen. This is not a good sign. To make matters more complicated, his brand new line won’t bleed back, so we can’t keep an eye on whether this has spread to his line or not, and previous bloods showed his liver was struggling too. Rowan is becoming more and more frustrated and downhearted. This is the summer holidays, he is meant to be having fun, many days out have had to be cancelled unfortunately, and he is getting more and more upset as time goes by. As he has got older he is far more aware of his difficulties and right now he is frustrated with himself and his body that he isn’t getting better. All we can do right now is wait until the right doctors are available at GOSH to find out what the plan is. Being in hospital this long, unplanned, is taking its toll on everyone, especially Cameron and Ayden, who are being farmed out wherever possible or spending hours and hours each day at the hospital, missing out on their summer holidays and all the fun things we had planned have had to be cancelled. We are really hoping things are sorted this week, as we’re meant to be going to the hospice next week for a break, a bit of touristy stuff, and some R and R. We haven’t been for such a long time and are really hoping for a turn around this week. After our hospital admission we continue on our rollercoaster. Rowan’s weight is up and down, as are his pain levels and fatigue. His reflux is becoming more problematic too. While we love the warmer weather it wreaks havoc on Rowan’s body. He is extra pale and extra tired, so we are waiting to see if they want to give him more fluids in his TPN. Unfortunately, we haven’t made much more progress with his feeds, some days are better than others. Progress is painfully slow with lots of side steps, but we’re doing everything we can! We heard this week that funding was approved for Rowan to re-start growth hormone treatment, so we are just waiting to hear from the company to arrange this. We tried it before and it didn’t work, but the team decided it was worth another shot as the difference between him and his peers is really really obvious now, he is a perfectly proportioned 3 year old, only he is 7! On that note, I just wanted to say a HUGE thank you to everyone who sent Rowan a birthday card. I honestly think that’s the most cards he has ever had! He LOVED them! We went to West Midland Safari Park for his birthday and he had an absolutely fantastic time, it is his favourite place ever! We are spending quite a lot of time busying ourselves with some fantastic days out, travelling around the country and we can’t wait to continue them especially now the weather is warmer! Thank you to everyone who sends post, whether it’s a one off or regularly, every letter really does count. Rowan just came home after almost 3 weeks in hospital. It was a long, gruelling process, but we may be uncovering some more answers with Rowan’s gut. We have successfully managed to reduce Rowan’s TPN hours to 20 a day, and with a small amount of feeds the other 4 hours. It’s a huge achievement and I am so proud of Rowan. It does cause pain, and there is a lot of stomach distension and other issues, but we’re doing the best we can. During this time the other children were in foster care and had a rough time too, but we are glad to all be back together. It will just take time and patience to adjust. Post is instrumental for Rowan through the bad times of the week. It focuses his mind on something else for a few minutes, other than being uncomfortable and grumpy. Thank you, again, for everything you do! Rowan has been quite poorly but is finally over the worst of it. He still has a central line site infection which is driving us both insane! We have just got back from a 2 week admission at GOSH. We went for physio rehab and it was a very rough 2 weeks, but he has made some lovely friends and they bonded really well. However, apart from an improvement in his balance, I can’t see any noticeable difference in him. He also lost 1kg while we were there which was weight he didn’t have to lose! The gastro team have changed the plan to hopefully fatten him up again. While we were away at GOSH, adaptations on our house began and in fact are almost finished. A ramp outside the front and a wet room have been installed. The through floor lift should be finished Monday, so I have been busy decorating Rowan’s bedroom and the bathroom… minions of course! As always, Rowan likes to make life complicated. The theory behind him having no central access is that he has lots of little clots in his veins, preventing the access, which would also explain all his very prominent veins that have worsened over time on his chest/neck/face. He has also been suffering with headaches. All his blood work looked fine so it wasn’t dehydration or anything else. I decided to go and get his eyes checked, as sometimes it’s hard to remember the ‘normal’ things it could be when you have a child as complicated as Rowan! It showed that he has a small prescription but nothing worth worrying about. However, he has reduced 3D vision and his eye muscles are having to work extremely hard to focus, which is resulting in double vision when his eyes get tired. A referral to ophthalmology at the hospital is the result and I have to watch him on the stairs/kerbs/uneven ground. As always, we try to live our lives to the fullest. We are going on holiday soon and I think we are all looking forward to it as it’s been a very rough few months! Thank you to everyone who sends post. The post has been a fantastic distraction and a welcome reminder that someone out there is thinking of Rowan while he has been so poorly. It continues to be well received! 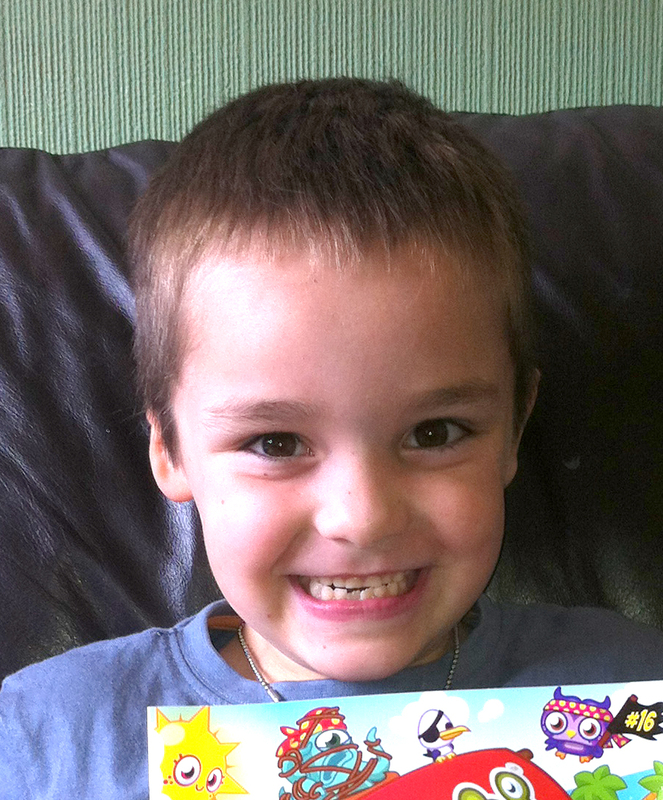 Thank you to everyone who has sent cards, letters and postcards to Rowan and his siblings. His favourites are Kim and Stevie, Sarah and Fudge, Marty Longo, and the ones he gets from various schools. Thank you to the amazing paper cutters out there who have provided us with 5 exceptional pieces of art! I can’t wait to get them hung on the walls!! Rowan continues to battle infection after infection. He recently had to go to GOSH for an urgent line replacement, however this did not quite go as smoothly as it should have. Rowan is lacking central access, which in theory he shouldn’t be at all because he has only ever had 2 lines. This is another part of the Rowan Puzzle. Since then we have managed to clear the infection from his line, however we have a persistent line site infection. Rowan’s new line site is also infected and it’s extremely sore. The stitches had to be cut out over 5 weeks early due to the swelling and infection making the situation unbearable. This then makes him extremely tired and struggling to maintain his body temperature with him just wanting to constantly nap. He has now missed 4 weeks of school and he is getting very down and very sad and he just wants to go to school. Unfortunately he just isn’t well enough and the couple of times he has tried they are phoning me after an hour to go and get him again. We have just arrived home from a few days at the hospice where Rowan had his nails painted, went in the spa bath, and generally caused chaos (as usual)! This meant that I could go out for my birthday – the first time I have been out in 2 years for a few hours. It was just in time as we are heading to GOSH on Sunday for 2 weeks intensive physio rehab where we are hoping to gain some strength and muscle tone. It means another 2 weeks off school, but he should be good for the last 2 days of term. He will be saying goodbye to the best teacher I think he could have ever wished for. The last 8 weeks or so Rowan has been really quite poorly. Something as simple as a bug evolved into bacterial tonsillitis, which then manifested as referred pain. He then had a line infection, which required 2 weeks of antibiotics, and an urgent blood transfusion. Hopefully Rowan is now on the mend after his weight plummeted to less than 12kg. We went to clinic this week and rather than discussing an Ileostomy as everyone believed that was the next step, the motility consultant said no. Therefore that is now not the plan, and the plan is, no plan. How we are right now, is the plan. It’s far from what I anticipated, as the simple answer is that they just don’t know what’s wrong or what’s going on, or which non invasive tests they can run to find out. The results from January do show a problem, but at this particular moment in time it’s irrelevant as he is still un-feedable. It was all a bit of a shock! Rowan had his birthday last week and was a very lucky boy. Thank you to all those who sent him cards and presents! He had a fantastic day with his friends at his first ever birthday party. Friends and family came from all over the country to celebrate and he thoroughly enjoyed himself. Thank you for making his day extra special. I just wanted to start by saying a big thank you to everyone who sent Katrina, Cameron, Ayden and Rowan, Christmas cards, letters, gifts, reindeer letters and elf gifts. I know a lot of time, thought and effort went into those and we thoroughly appreciate it. Rowan has been very up and down with his gastro issues, one day he is ok and the next 4 days he is in agony. As always, he faces things with a smile and a determination. He wanted to try Turkey on Christmas day, so, along with the festive spirit I plated some up for him. Unfortunately it didn’t go too well, but you’ll never know if you never try. We started 2015 with a 3 week admission to Great Ormond Street Hospital. It was a planned admission, but also a very difficult admission for all involved. It requires lots of communication and lots of organisation which inevitably went very wrong some days. However, despite the tortuous pain Rowan had to endure for the first week, we made it through, although he is clearly still considered ‘unfeedable’ and therefore for now TPN is his life line. He had a brand new gastro test, which has some very interesting preliminary results, which are beginning to show what is happening in Rowan’s system and how completely unique that is. Once the official results are in, it’s time for conversations as to what happens next and what our options are. The third week we were handed over to the endocrine team for some repeat tests. The main aim was to see if Rowan could manage any time at all off of his TPN, to be free from so many wires, and be able to ‘run around like a hooligan’ as Rowan put it. The short answer to that was no, but again we need to wait for the official results. The pain team also came to review Rowan and he is now a very proud owner of a TENS machine. He absolutely loves it and it really helps with his back pain especially. For now we readjust to family life once again, and begin the painstaking task of trying to get Rowan to regain the 1.3kg he lost in those 3 weeks. Hopefully the next time I update there will be a more concrete plan in place. Last time I updated Rowan was due to go to GOSH. We arrived there and due to Rowan’s haemoglobin level being too low the whole admission was cancelled. From there on it snowballed; by the Friday of that week he was admitted to our local hospital as he had a temperature which then transpired was quite a nasty line infection. Obviously this causes great concerns as line infections are a huge risk. Rowan spent that whole weekend in hospital and started IV antibiotics and had several fluid boluses as well as a blood transfusion. The next 2 weeks were filled with hours each day infusing IV antibiotics and drawing them up, mixing them, as well as ensuring all his blood work remained stable. It was a very demanding regime. Rowan finished the antibiotics on Saturday and by the early hours of Monday morning he was feeling unwell again. Today (Friday) Rowan had to be collected from school early and taken to hospital. The bug is back that he had at the beginning of September. So once again we resume the very same regime of IV medications to hopefully make Rowan feel a lot better, and hopefully get rid of this bug well and truly. Rowan has now been septic for almost 2 months solidly and it’s taken a toll on him, he is sick of feeling rubbish and missing school, and he is also getting frustrated that he physically can’t do as much. 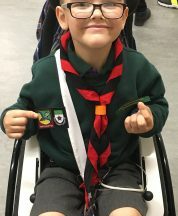 He has lost strength and stamina in his muscles and this is causing lots of problems for Rowan, but as always, he approaches each situation with determination, a big cheeky grin, and just a pinch of attitude. Thank you for Rowan’s post. Rowan now recognises Marty Longo’s post without even having to open the envelope and he is always excited to receive post from Kim and Stevie. Please can I remind people not to send balloons to us though as Cameron has a latex allergy. Rowan has been on 24 hour TPN now for nearly a year. It’s been hard work, they still can’t get his levels right, this time his potassium and sodium are very low. He also had a line infection a few weeks ago and he was really quite poorly in hospital but he bounced back quickly and we managed to go on holiday with Mummy doing the gruelling IV regime. As it stands at the moment we believe Rowan isn’t absorbing any of his medicines anymore either. His pain has increased dramatically recently and a day out to GOSH took 36 hours to recover from. Our first trip to the hospice was fun, but again they commented how uncontrolled his pain was, so they are trying to get us some help with that. It took Rowan 48 hours to feel better after being at the hospice, he really wasn’t too good at all!! Post helps more at these times than you can imagine, as a distraction and as a reminder that people are thinking about him. The excitement sometimes overrules the pain for those few minutes. Katrina, Cameron and Ayden also thoroughly appreciate their post. They know that although Mummy is often very busy with Rowan, they do have something for themselves, and will take themselves off somewhere quiet to play with their little gifts or read their post. Thank you to everyone who continues to send post to Rowan. He will be back at GOSH on 15th September for a few days for some more tests. At the moment I hope they find something, that a test comes back abnormal, so that we can help Rowan, in some way at least. There is currently no option for him other than 24 hour TPN. No forward plan as they still can’t work out what’s going on, but he is definitely unfeedable. Despite all this he adapts and faces most days with a smile and determination. Thank you for still posting to Rowan. Rowan has been doing ok since the last time we updated. Still struggling with his pain and fatigue but working on getting a good balance for him. We have been concentrating on living life for the last few weeks! We went to GOSH for the endocrine admission and it all went a bit wrong, and as no one was prepared to risk Rowan’s safety, obviously, we are rebooked for the 14/9 to do things a much safer way. Rowan’s MRI was, on the whole, ‘normal’. There were a few abnormalities but nothing we didn’t know already. So he is booked for a nuclear medicine test. Rowan had a line infection, Klebsiella, last week. He showed signs of being unwell at 7am, but by 8:15am I was in my local hospital where he was extremely unwell for over 12 hours. However he pulled through and bounced back and we were discharged on twice a day IVs 48 hours later! We then went on holiday. We went to Camp Bestival and has an absolutely amazing time despite the relentless IVs, but we were determined to go and enjoy ourselves! Rowan has his first hospice stay next week and we have everything crossed it’s ok. It’s like an assessment to see how many nights we are entitled to as respite. While we are there we are hoping to fit in some of our new hobby, geocaching!! Thank you so much for the post, especially Karen and Toni, and Kim and Stevie, and Sarah and Fudge the cat, and also the regular cards from Marty Longo. Rowan has recently been back in to Great Ormond Street for 2 weeks to try and get him back onto some milk into his small bowel after the clinical incident last September. Unfortunately this completely failed, but we have not yet given up. Rowan is awaiting various tests and scans to still try and figure out what is going on for him with a view to finding a way forwards, or back to where he used to be. We have, however, had the discussion that Rowan can live purely on TPN and lollies for quite a long time as long as his liver manages ok and so far it seems ok. Rowan will also be going back into GOSH for a week on 12th May to try and determine why he is no longer responding to his endocrine treatment plan, and find a way forward with this too. His pain is also, as always, an issue, but he soldiers on through determined not to let it ruin his life. Sometimes he’s a little too determined and we are still figuring out the pacing! I wanted to say thank you to those who sent Rowan birthday cards and gifts, he was very pleased! It means so much to him to receive these as none of his (or my) family sent cards, or really acknowledged this huge milestone of turning 5. We went to West Midlands Safari Park for his birthday and he had a fantastic time, as did Cameron with all the animals! Rowan just wanted to say a really big thank you to everyone who sends him and his siblings post. We are going through a pretty tough time at the moment and post brings the much needed distractions. Rowan has been quite poorly. He has needed a course of IV antibiotics for a line infection and has lost an awful lot of weight and all his muscles are wasted and all his tone is awful. He will now need splints and is spending a lot of time in his wheelchair. The physio has said he will need to go back to a walking frame for a while soon as he is struggling so much. So it’s a huge step backwards for him, but we are remaining positive that this is just a blip. However, another GOSH stay may be imminent. We have 4 weeks to turn things around. His pain is difficult to manage and he is tired all the time, very pale and very inactive. He still has that cheeky gorgeous smile and plenty of attitude though. We had a really nice Christmas at home just the 5 of us. Much excitement over Rowan’s walkie talkies from Santa (the one thing he asked for!). Thank you so much for all the elf gifts, Christmas gifts and Christmas cards. With no family and very few friends it makes us feel very loved!! There are a few people we wanted to say thank you to. The high school in America who made cards for the children, thank you! The brownies who sent Katrina’s elf parcel! She loves her box of treasures, thank you. Sarah and Fudge thank you (we knew it was you even though there was no name on it). Thank you Glad, for always finding amazing Mickey Mouse items!! I also wanted to say a really really big thank you to Kim. Thank you for organising the elf project, we had great fun choosing the gifts we sent, as well as receiving some. Like I said, it’s nice to know that there is someone out there who spent time thinking about my children and the difficulties they go through, especially being so isolated. I also wanted to say thank you to Kim for making sure I wasn’t left out this Christmas and I already have some recipes written in my new book. Thank you everyone. The last month has been very eventful for us all, and not in a good way. Rowan went for a routine procedure to check out how his gut was doing and due a clinical error (that is now being investigated) spent a total of 32 days in hospital. Rowan had to have emergency surgery 12 hours after coming back from the planned procedure, to correct a huge error that happened, that has never happened before. He came out of theatre the second time and was very sore physically, but also scarred mentally. He had to have his stomach stitched back to his abdomen wall, and his gastrostomy tract sorting out. He had peritonitis, he then had a reaction to ketamine (he came out of theatre with analgesia) so had to have morphine only. He then grew 2 abscesses in his stomach. He then had an allergic reaction to an antibiotic that took 10 days to get under control. He then needed a blood transfusion. He then spiked temperatures. When we finally got to a point we thought we were winning we tried to give Rowan dioralyte. He was on 24 hour TPN until this point, completely nil by mouth. We gave him 5mls an hour, a teaspoon an hour, of basically sugary water, and the pain was immense, he needed extra pain relief. He didn’t leave his bed for weeks and weeks at a time. Something wasn’t right. So we let him have longer gut rest. We then tried again, 4 weeks after the emergency surgery and got the same response. His gastrostomy drainage output has almost doubled, it has blood in it, he’s still not very well. He had an endoscopy to see if they could see a reason for all the problems and everything seemed to be ok. So they could not find a reason for all his continued pain and feeding problems. So, after 32 days, we came home. Rowan is still considered ‘unfeedable’. He has gone from a child who eats, has milk, and TPN, to a child who is on 24 hours TPN and has medications Intravenously, which he has not required up until now. At the moment he still doesn’t really show much interest in food, which is extremely concerning. The doctors are hoping that a while longer with gut rest and he will be fine, but they don’t really know to be honest. Two days before we were due to come home, Ayden, Katrina, and Cameron came to visit us with some family friends. Ayden got hit by a cyclist while crossing a road, was thrown in the air, and smashed his forehead on the kerb. One car journey, immobilisation and ambulance journey on a spinal board later, we were at A&E with a big gash on his forehead that goes right down to the skull. They were unable to ‘fix’ him that night, so I had to take him back to UCLH on Saturday morning for surgery to fix his head. So I had two children, in two hospitals in London. It was certainly a long month! Now that we are home, we have had half term. It’s been hard adjusting to a new routine, with all the children here all the time. Rowan’s mobility has decreased and he’s is so exhausted so quickly. We have had fun though thanks to a couple of friends, we have made this half term the best so far, from pumpkin carving, to hilarious road trips, to the cinema, and to bowling. All working around Rowan’s new harrowing schedule, but we did it. Rowan is back at GOSH on Friday for another minor procedure, hopefully it really is minor this time! Thank you to everyone who sent Rowan post while he was in hospital, Dottie, Glad, Kim and Stevie, Louise, Karen, Toni and Connor, Laura J, and everyone else who sent us post, there are too many to mention. You have no idea how much these letters, cards and postcards mean to a bedridden child in pain.Some days the only time he would sit up, was when the post arrived. Rowan is doing well, but still isn’t well enough to go home. We have tentatively started feeding him. He is still requiring morphine for pain. We will be here a little while longer yet. Thank you to those who send post, it really does make him smile. The first time he sat up after his emergency surgery was to open post. Just wanted to let you all know what’s been going on with Rowan recently. We came to GOSH for a routine motility test – the same one we tried in May but failed. It failed again, but he just wasn’t right afterwards. It was put down to being sore. We gave him medicine in his tube like always and he screamed. Very strange. Then he tried to sit up and he screamed solidly for 6 hours in agony. While everyone tried to work out what was going on, he was just in so much pain. At 11.30pm, 12 hours after we came back from IR, we finally had doctors and anaesthetists and surgeons and radiographers. While they were still working it out a consultant surgeon came in, took one look at him and said theatre NOW. By 00.15am he was in theatre and at 3.45am he came back with the perforation and displaced gastrostomy resolved. Hooked up to ketamine and morphine, and very very sore. He then had a reaction to the ketamine, couldn’t wee, and has numerous infections. So that’s where we are now. He is not allowed to eat until next weekend at the earliest. We are just taking it one day at a time, he is not recovering as quick as the teams would like but always at his own pace. Thank you to Denise and Kim and Glad for both mine and Rowan’s bits. Amongst all this I passed out when we went to get Rowan from theatre the second time due to lack of food and fluids. It’s hard to explain how you can just forget to eat and drink in a crisis, and this combined with a lack of sleep, and high stress/anxiety lead to me having a little lay down on the floor. I am ok now and thanks to Kim, Glad, and Denise, I have food and drink supplies whether I can leave the ward or not. Thank you. Rowan’s life has been the same as the last post. We still battle the pain, and now he is carrying his backpack around more often he is getting a pain in his back that he says is ‘burning’. So far we aren’t sure if it’s helping or not but we’ll see, these things are never quick to change for Rowan it’s always slow progress. On top of that he has yet another infection, so more antibiotics for him. He is getting pretty sick of them to be honest, with ‘not ANOTHER one’ when the extra syringe is added to the row of other syringes with medicines, all of which he has little nick names for, and I tell him it’s an antibiotic. But life is how it is for him, and he’s determined not to let it get in the way. Rowan started school last week. He has had 4 days there and he is LOVING it. It makes him exhausted, his pain has increased, but he is so happy to just get up and go to school each morning with a bit smile on his face. Thank you to those who sent Rowan ‘1st day at school cards’ I didn’t even know they made those!! He was really thrilled! Today he went sailing with his new carer. Rowan has a couple of favourites when it comes to carers, and I am sure the new lady will be a firm favourite! He had an amazing time and looked so happy. I am rather jealous however! In just 15 days time Rowan will be admitted to GOSH for 3 days. Then he will be home for a week, and then he will be back for 5 days. These are for the tests that failed at our last admission. Thank you so much to Sarah for Rowan’s underwater dough as that is in the box to take to GOSH, along with the activity book. Thanks to Karen and Toni for Rowan’s stationary for school, we can’t wait to use it to start learning to write. I can’t remember who sent Rowan a pencil shaped pencil tin with mickey pencils inside, but thank you for those too. Thank you to Viks for Rowan’s fab ride-on JCB it’s a firm favourite!! Also thank you to Glad for the top, he really will be a Brighter Spark soon! I just wanted to quickly apologise for not updating recently. Illness has gotten in the way. Since the last admission, things haven’t really changed too much. Rowan’s pain has not really improved and he’s now struggling with lower back pain. We checked that his spine is ok, and it is, and we checked that his kidneys are ok as he had nephrocalcinosis before, but that seems to have gone as well. Apparently it is very uncommon in young children to have back pain and they could come up with no reasons or solutions or treatments, so this continues for him. Rowan is due to go to GOSH again next month to try and redo some of these tests although at the moment it looks like there are problems with his gut which prevent some of these tests being done. As it stands, we have increased some of his medicines to try and help him out; we have changed his formula milk, increased his TPN a bit. We were reducing his TPN to try and wean him off, as that was always the aim, but we got to a point where he was unable to make simple decisions, such as ‘which film do you want watch’ and he became very clingy and upset, and very high maintenance. Since increasing the TPN Rowan is back to his usual self, making choices and making sure we are all aware of them! We tried to get Rowan off his milk feed for longer in the day times, but he is having 3 hours sleep in the day. This is not usual for a 4 year old. So we are going to try and go back to feeds in the day to see if it gives him a bit of an energy boost, and stops him being so exhausted. He also now has a drainage bag attached to his gastrostomy for a bigger chunk of the day to try and easy some of the bloating and stomach pain and it seems to be helping a little bit. We are also still plagued with a multitude of infections that we just don’t seem to be able to clear no matter how many antibiotics we throw at them. Apart from the extras we have been thrown, the main focus over the last couple of months has been on sorting things out so that Rowan can go to school in September. He is SO excited to be going to big school with Cameron, Katrina and Ayden. He has met his teachers and his helpers and he can’t wait. He will only be going part time, to try and limit the pain a little a bit, and we’ll see from there. Rowan loves all his post. Thank you so much for making him smile, it really does brighten the children’s day when the ‘post lady’ arrives. Rowan just wants to say a really big thank you to everyone who sends him post, especially when he’s not doing so well. Rowan was in GOSH for what was meant to be a battery of tests to help us understand Rowan’s gastro problems better. However this just didn’t happen. When we arrived we did the usual blood tests, swabs etc. I already knew he had infections, and took the swabs over a week before we were due to go to GOSH in the hopes we could get some treatment, however this didn’t happen, and Rowan ended up riddled with infections. Each time he gets an infection it progresses more quickly. So, a lot of the tests were cancelled. Rowan had an EGG (Electrogastrogram) and he had a liquid gastric emptying study. They attempted to do an ADM (Antroduodenal Manometry), but they couldn’t get the probe in, they tried for 2 hours. The radiologist said that his stomach and his bowel just aren’t right. Usually the gut helps to push the probe through but it wouldn’t. They even tried taking his Gastrostomy out and pushing the probe through the hole there and it still wouldn’t go in. It would appear from this that he has gut dysmotility. This is no huge surprise to anyone to be honest. It took two hours of them pushing, pulling, poking, prodding, luckily Rowan was under General Anaesthetic but he is very very sore, and currently not eating properly. We also saw our new Endocrine doctor, who believes he may be able to give Rowan a partial diagnosis at some point and has a few different ideas as to what may be going with Rowan from an Endocrine point of view. For now Rowan’s care has increased again, his list of medications has rapidly grown. We will probably have to go back to GOSH for the tests to be done. The pain team didn’t have any ideas really, they considered a TENs machine, but decided he was too young, although they did recognise the pain (thanks to the aid of videos) and are hoping to get my local team more on board with his issues. We will have to also go back to GOSH for 2 weeks of Physio rehab at some point too as it’s agreed his mobility is worse and he is even weaker than he was before, despite the physio, so they need to look at him again properly, which will be the 12th June. Thank you for all Rowan’s post! He LOVES his letters from Blossom (Kim Lawrence), and all the Dottie post. As always, Denise knows just how to make little man smile, and Rowan’s book from Glad kept him entertained for ages in hospital. Receiving the post actually in hospital, made his day. He was SO excited! I hope to update again soon, with more positive news hopefully. So, it was November since we last updated! Since then we had Christmas, which was the best Christmas I think we’ve ever had. We went away for Christmas and the children had a fabulous time, and were very very spoilt! Since then, Rowan has continued to struggle with his pain and fatigue. We have not been able to get him to nursery for any longer than 90 minutes per day and this causes him pain. However, he faces it with a determination, and no matter how much pain he’s in, he wants to go to ‘nerfery’. There has been no progress on this side since November, still no one is investigating his pain, or helping him, or providing us with any better pain relief. It is these times when post really helps Rowan. When the children’s post arrives, they get so excited and are really happy. The children love reading through the post and trying to decipher some of the handwriting. Rowan went back to GOSH last month for an outpatients appointment and we are trying to wean Rowan off of his TPN. This is difficult being a single parent as he regularly wakes up through the night hungry due to hyperphagia (obsessive eating). He has gained a little bit of weight and a little bit of height and now seems like a good time. Unfortunately this is not as easy as it sounds. Rowan is on an enteral feed. He is fed directly through tube into his small bowel. He is fed a very special very concentrated prescription formula milk, via a pump and this is now 24/7. In order to wean him from his TPN, we have to increase the feed as we decrease the TPN. This is already causing problems. Rowan is in more pain carrying his backpack around and he has leg pains and back pains. He is also suffering again with bloating and stomach pain/cramps therefore he is needing to have a drainage bag, attached to the tube that is in his tummy (he has two tubes) to try and drain out whatever is causing the bloating. Some days are better than others, some days he’s absolutely fine, other days we flit between screaming and clingy and asleep. Also, since I last updated the children and I have moved house. It was very exciting but also quite difficult for the children. They now seem to be settling, and have the added bonus of being able to ‘play out’ now that we don’t live on a main road anymore. There are lots of other children who live near us too so they have been making friends. I can’t wait until the summer when I am sure they will be outside all the time. Also, we now have a nice little garden, which will mean that Rowan can also play outside when it’s warmer. February brought us a letter that I had been awaiting for a long time. The confirmation that Rowan is starting school. He is going to the same school as his big brothers and sister in September. This is such a huge milestone for any child, but especially a child who has struggled and continues to struggle, like Rowan. Luckily for us this means that the 1:1 he already has for nursery, should go with him into reception, so there shouldn’t be too much upheaval. Also, as Ayden is already in reception, Rowan has regularly visited therefore shouldn’t be too difficult to transition. I took Rowan into our local school uniform shop and ordered Rowan’s ‘smaller than usual’ school uniform jumpers. No one is quite sure where to find trousers to fit him, or tshirts, but we’re working on it! At the moment we are not sure how school will pan out for Rowan as he currently doesn’t attend the 15 hours all other 3 year olds who go to nursery do and he is very nearly 4. It’s looking highly unlikely that Rowan will be going to school full time and will start off part time. How we increase that we’re not sure at the moment with the pain being so prevalent, but he is very excited to be a ‘big boy’. April brings us a very very exciting week. Rowan, Ayden, Cameron, Katrina and I are going on holiday. This is our first ever holiday. We are going with a couple of my family members and the children are extremely excited!! We are off to Devon. It’s all booked and paid for, school have agreed the children can have a week off school, and the car is hired. Two adults, 5 children, and a 5 hour drive to Devon. This is no mean feat with Rowan, but we are determined to make some happy memories. The children have had a lot of post. Ayden loves receiving his letters from Liam and is writing one back as I type. Katrina loves reading the letters from Laura J. Cameron receives a lot less post than the others, but loves his post from Jacqui. Rowan absolutely loved the card he received from class 1CN! And the Easter Bunny ears and Bubbles that Sarah and Fudge sent went down a treat! All the children are so excited when their post arrives, it really brightens their evening. Thank you to everyone. Rowan has received some really lovely postcards this month. Thank you to everyone who has sent him cards, little notes, postcards, little presents, stickers. He appreciates everything. This month has been really rough on Rowan with pain in his legs. As yet, no one is treating this pain with pain relief, or investigating where it’s coming from. It’s affecting his sleep, and mine. On a positive note, those night nurses are earning their money! Rowan’s still not gaining any height, despite the doses of Growth Hormone, so we now need to try and cut his calories down to prevent him from becoming overweight, as although gaining roughly 100g a month is pretty rubbish, without growing upwards, the extra weight will begin to cause lots of problems. As yet we don’t know why he isn’t growing upwards still. Rowan remains on TPN, but it’s all being tweaked to try and reduce the calories. The problem with this is that the more TPN they take away, the more oral food Rowan eats to compensate. He has an additional label of hyperphagia to go with everything else. With all the additional oral foods, his gastroenterology problems are exacerbated. So we’re back to bloating, stomach pains, constipation as well. It’s very difficult to keep on top of and keep him comfortable! On a positive note, Rowan is loving going to ‘nerfery’. Although this is still causing problems with pain, as a little 3 and a half year old it’s fantastic. He’s learning his numbers, and recognising them spontaneously and he’s working on putting them in order. He’s just coming on leaps and bounds cognitively. Physically he’s still really behind and the closer he gets to 4, the more noticeable the difference. Rowan is as yet unable to jump, he can’t step up the curb without needing to hold onto something, or someone. He is unable to negotiate uneven flooring still. He struggles to climb up and down things. Despite this, he still manages to cause chaos, with a big cheeky grin on his face! Sending Rowan to nursery was one of the hardest things I have ever had to do, but it’s paid off as he loves it. And, despite the pain, he gets everything he can out of nursery. He can tell you who his friends are and it’s really nice that he’s being able to access the things he deserves. And for that, we are grateful to the school, they would do anything to keep Rowan included. For example, this week, Rowan will attend his first ever DISCO!! He will have someone with him one to one, to keep an eye on him, and that one to one will not be me. He is learning some independence, and that we are not attached at the hip, and I am learning that i can just be Mummy sometimes, like the other Mummies. I don’t have to be there, I can pick him up afterwards and hear all about it, like I do with Ayden, Cameron and Katrina, rather than already knowing, because I was there. Ayden has been into GOSH as well. It has been confirmed that Ayden has a problem with low blood sugar levels, hypoglycaemia. He is not coping too well with this, as he’s not allowed to go all night without eating. An average 4 year old should be able to fast 18 hours with no real problems. Ayden was struggling after 7 hours and at a dangerous level after 10 hours. Therefore he is now no longer allowed to go all night without eating. I have to wake him up around 10pm for a drink and a snack. This is causing problems with his sleep pattern and he’s back to having a sleep in the day, usually just after he comes home from school! We await a better plan from GOSH as this can not continue for him, or for me. It would also appear that Ayden is not growth hormone deficient as originally suspected. So where the hypoglycaemia comes from we don’t know as yet. Cameron and Katrina are doing as well as can be expected at the moment. Lots of changes happening at home, and I am doing the best I can to keep things to a minimum, and keep things consistent. We are moving house in the new year and the children are looking forward to being able to choose how they have their new rooms. They have all agreed that they will dedicate a space on the walls in their rooms for all their fantastic post, so when they are feeling a little sad, they can look at the letters, pictures, cards and postcards. This will all happen at the same time Rowan goes back into GOSH for 2 weeks for some more horrendous testing to try and form a better plan, and to try and work out what’s going on, and maybe get a few more diagnosis’. At this point I don’t get my hopes up. Lots of plans are always mentioned and nothing seems to come of them. Communication is often not medical professionals’ forte! So for now, we plod along as best we can, looking forward to Christmas, and a fresh start in 2013! Thank you to all of those who send messages to me too. I really appreciate them, especially at this difficult time. Rowan has now started nursery and is thoroughly enjoying his time there. Although this is an activity that he loves, it comes with it lots of problems. Rowan is having problems with his pain levels and he’s getting every single cough/cold/runny nose possible. He has also had infected feeding tubes for around 4-5 months now. We are on our last option to clear the infection, and it’s still there, and yet no one knows where we go from here, or why he’s constantly got infections. Rowan has also had problems with his blood sugars and his gut. It’s not really working properly and no one is sure why. Next week, Rowan and Ayden are off to Great Ormond Street again, both for various fasting tests and xrays, to try and maintain a little more stability for them. Whilst Rowan is struggling, he always approaches it with a smile, although more recently he’s been very clingy and cuddly. On a plus side, his weight and growth has remained static all this time, and while that’s a little frustrating because he should be growing (especially as his appetite has increased again) it’s also positive because being ill and struggling with infection hasn’t caused the usual big weight loss. Rowan will also need to go into Great Ormond Street soon for about 3 weeks for motility testing to find out exactly which bits of his gut aren’t working properly. These tests are not very nice for any child. Also having our family completely separated again will cause problems for all the children. The children would like to say a huge thank you for all their post, and letters, and monthly projects! Rowan particularly loves the Mickey mouse tshirt that Glad recently send him, and all the children love their post from Natashja. They often receive more postcards, cards and letters, than i receive, and it’s a lot more exciting that’s for sure!! On those days that Rowan really struggles and a letter lands on the doormat for him, it instantly puts a smile on his face. Thank you so much for making my children smile, especially at the moment.